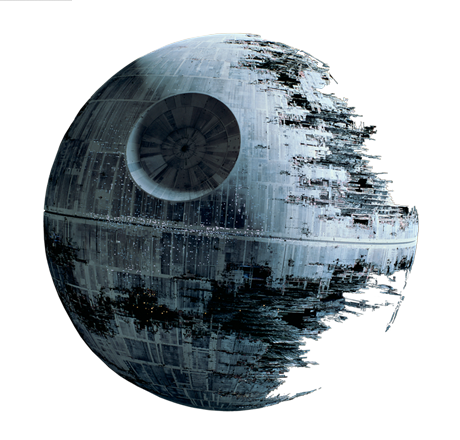 The Death Star, that massive structure that traveled from planet to planet leaving destruction everywhere it had been, is a powerful image that many of us grew up with. While the Death Star was wreaking havoc across the galaxy and adding to the power of the Empire did you know that it wasn’t completely done? It worked and it could explode a planet, and at the same time was not fully completed. It was not Jedi or droid proof yet, as we watched Obi-Wan Kenobi and R2-D2 deactivate various safety features. With its 10,000 turbolaser batteries, 2,600 ion cannons and over 768 tractor beam projectors it was still unable to stop a single X-Wing fighter from destroying the Death Star. The other things that you didn’t see about the Death Star that were not fully functional included the dining area for the crew of over 265,000, troops of over 607,000 and the over 180,000 pilots. The designer had not completed with all the little nick nacks and there were other things that were never seen as incomplete as the Empire would not let the camera crews into those areas. Get to work! It doesn’t have to be complete for you to get started. If you are that Ready, Aim, Aim, Aim, Aim……person it is time to move on from that and get to work. If you are that person that is looking to make sure that you have just the right font, or just the right color, or everything looks perfect, just get to work already. If you are that person that thinks you have to have every answer before you might be asked the question, put that aside and go hear the questions that are being asked and figure out how you would answer them! Then, perfect that answer for the next time! There is a lot to be said for practice (or aiming) and there is also a lot to be said for too much time being put towards that. Practice please. Know the information you need to have just know that you don’t have to know it word for word, you need to understand the concepts. You can do the same thing and need to just stop planning to get ready and finally take that big step! You have heard this before, and it never hurts to hear it again. Don’t sweat the small stuff and pick up that phone, knock on that door, submit your application or whatever you are planning to do…GO DO IT! Remember, Star Wars took place a Long Time Ago in a Galaxy Far Away and if the Empire waited until the Death Star was perfect to attempt to unleash it upon the galaxy it then we might all still be waiting and never have had the chance to share in those wonderful memories. What do you mean it was just a movie and not real?